Good morning, everyone! 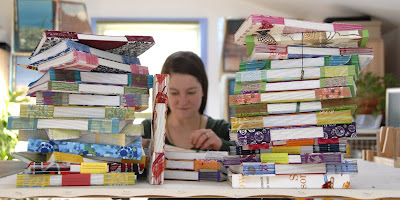 Today I have the pleasure write to you from Portland in Maine, and introduce you to Anna from Purplebean Bindery. Other than on Etsy, you can also visit her on her own website at www.purplebeanbindery.com. Hi Anna, nice to meet you! "Purplebean Bindery" - that sounds like a name that has a story attached to it. What is it? I wish there was a witty story behind my name, some day I’ll make one up. The real story is… Way back when e-mail was new my husband set up my account. From several rooms away he shouted ‘What do you want your e-mail address to be?’ Rather than some strange combination of my name and random numbers, I looked down at a picture in the seed catalog on my lap and said, ‘purple bean’. The name has followed me since. Like my e-mail address, I write it as one word – Purplebean. Last year was the first year I’ve had time and space to finally plant those purple beans in my garden – ruby moon hyacinth beans. Combining function, beauty, and good design is the main reason I make books. The books I sell on Etsy have primarily used the buttonhole binding. 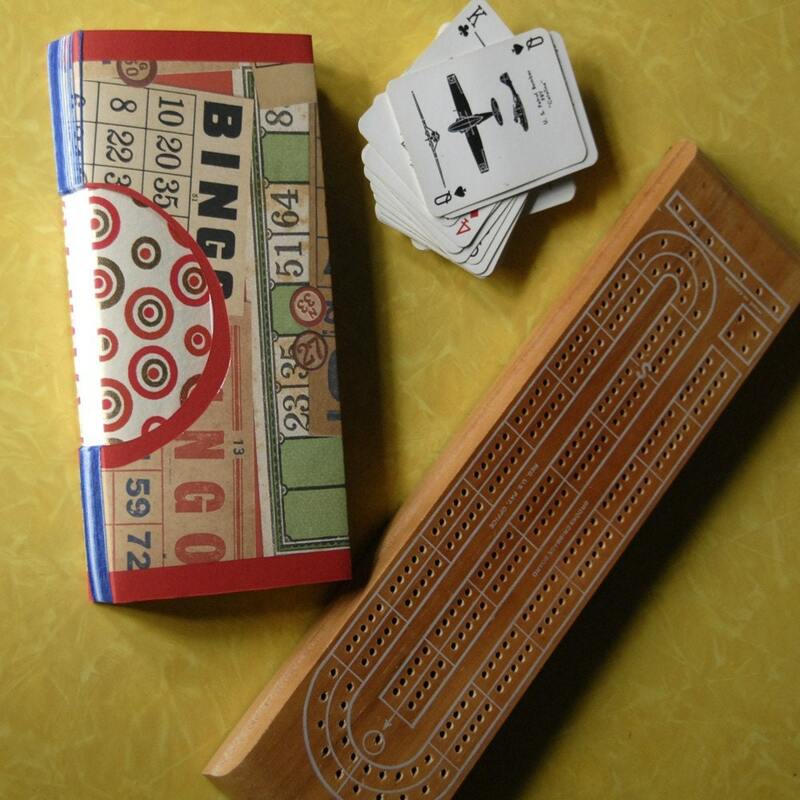 It’s a binding style I love because it’s both decorative and functional. 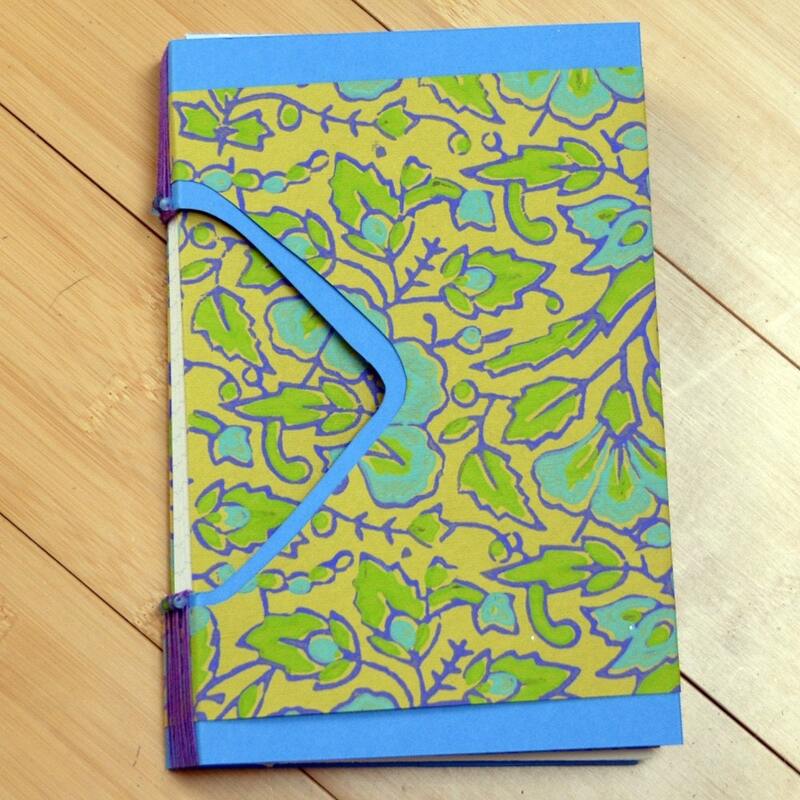 The binding allows me use a wide variety of fabric and colorful paper in the books (my two favorite art materials). 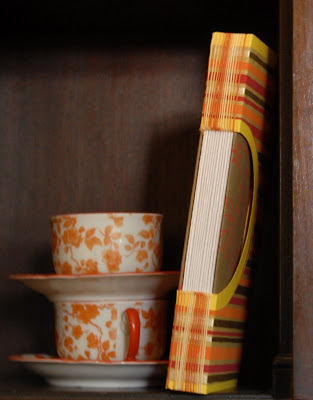 Buttonhole binding also allows the books to lay open flat, so they are nice to write or draw in. They can also be built with a little space in the binding, so if one wanted to paste in photos or collages, the books would still close without bulging. Recently I’ve been experimenting with selling other book forms too. I’ve made storybooks with printed pages for people to write and illustrate in (reviving the book that got me started in kindergarten). I’ve been working on small notebooks made out of recycled envelopes too, in an effort to be a more creative recycler and create books that can slip into a purse or pocket. I designed a photo album and guestbook in a box for a friend’s wedding and, because I can never make just one, have posted similar boxes on Etsy. I made my first book in kindergarten. Our class bound simple, pamphlet stitched books and filled them with pictures and sentences about our lives – likes and dislikes, our family, house, phone number, etc. Making books has stuck with me ever since. In college I took a bookbinding class and was introduced to bookbinding as an art form, both in terms of content and structure. College is when my obsessive binding started. I bought several of Keith Smith’s books and worked my way through the different bindings. After a while I had to start giving away my test books to make room for new ones. Seeing friends use my books made me realize how much I enjoyed making functional art. Purplebean Bindery began when I had to make some funds to support my binding habit. Do you use your own books? I use blank books all the time. I like to record things, so I have books to keep track of dinner party menus, favorite beers, garden notes, travel logs, art ideas, and endless photo albums. 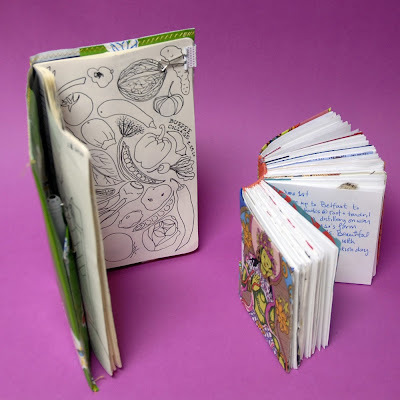 Last year I designed and bound a tiny, chubby, non-intimidating book to write in every day. This year I made a book that would encourage me to draw everyday, with a pocket for pens and refillable pages. I am not really a writer or a drawer, but I’d like to be. Having books designed specifically for these purposes encourages me to use them. When I make books to sell, I like to suggest in my Etsy descriptions how others might use them. My suggestions can run towards the silly end of things, but I hope having a nice book inspires people to be creative. Oh, wow, your photos are beautiful! Have you thought about combining the two skills: photography and bookbinding? I’m often asked if I bind my photographs into books. I’m constantly working on it in my head, but rarely act on it. For me, books designed for specific content are an entirely different beast than blank books. 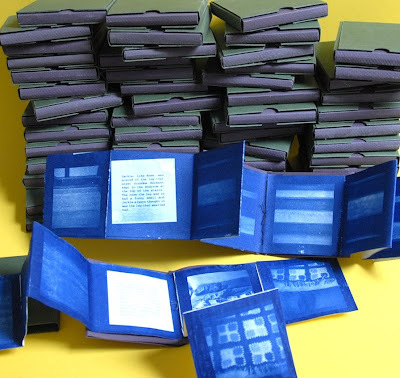 Some of the first books I worked on, and something I’d love to get back to, were cyanotype photos bound into a series of mini books. Each book has a small page of text about a family story and pictures surrounding it. The pages unfold in all directions. The piece as a whole, originally 100 books, dealt with oral story telling and the wonderful, flexible memories that make up a family’s personal history. Many of us struggle with making photos of our books. Maybe you have a simple tip for us to make better pictures of our products?My tips are very simple - good light and sharp focus. I use natural light, so I pick times and spots that have strong sunlight. Natural light is also great to capture more realistic colors. Other lights cast green, orange or yellow hues that will effect your pictures. You can correct these on the computer, but why make more work? If I can't wait for a sunny time, I use a tripod (or set the camera on a table) so my pictures won't be blurry. I think sharp focus is important and worth taking the time (and sometimes retaking photos) to get right. If you have auto focus, make sure the book is what the camera is focusing on. Beyond light and focus, I like to crop my pictures close, filling the image with the book. I get as close as my camera will focus when I shoot them and then crop the image even more on the computer if I need to. I also crop them square, as they appear on Etsy. Finally, I like to include details of each book, like the page paper and spine, and something for scale, like a pen or pencil. How does you typical workday look like? Trying to make it as a full time artist, I love that ‘typical workday’ does not have to be part of my vocabulary. In general, I do what needs to get done on any given day or where my creativity takes me. I love making things, so my days are full and productive, but I relish the flexibility to work on what I’m excited about that day, wther it be taking pictures, printing photos, binding books, or experimenting with new book forms. My photography is primarily printed using alternative processes (cyanotype and gum prints). These printing processes take time and patience, so I often have time to work on books while I wait for a photo to expose and develop. Some days I find it more productive to focus on one task and will spend the day just binding or printing. To truly appreciate the flexibility my life has now, I do have to keep some constants in my workweek. I get up early and have coffee with my husband before he goes to work. I do my best to go for a long dog walk everyday, combining this with mailing Etsy orders if need be. I make to do lists at the beginning of the week to help me stay focused and measure accomplishment (this sometimes seems silly to say, but when you don’t have a punch clock or ‘the man’ expecting a report by the end of the week, I feel it’s important). I always spend Wednesday mornings at the computer and on the phone doing marketing, promoting and keeping on top of the business end of art (it’s Wednesday morning as I type). The business end also often seeps into other days while I drink my second cup of coffee. I volunteer one morning a week in a soup kitchen, in large part to have some face-to-face people interactions. And because I work from home, I do my best to shut the studio door on weekends, give art making a rest, and be with friends and family, hopefully outside. Is there something specific that inspires you? 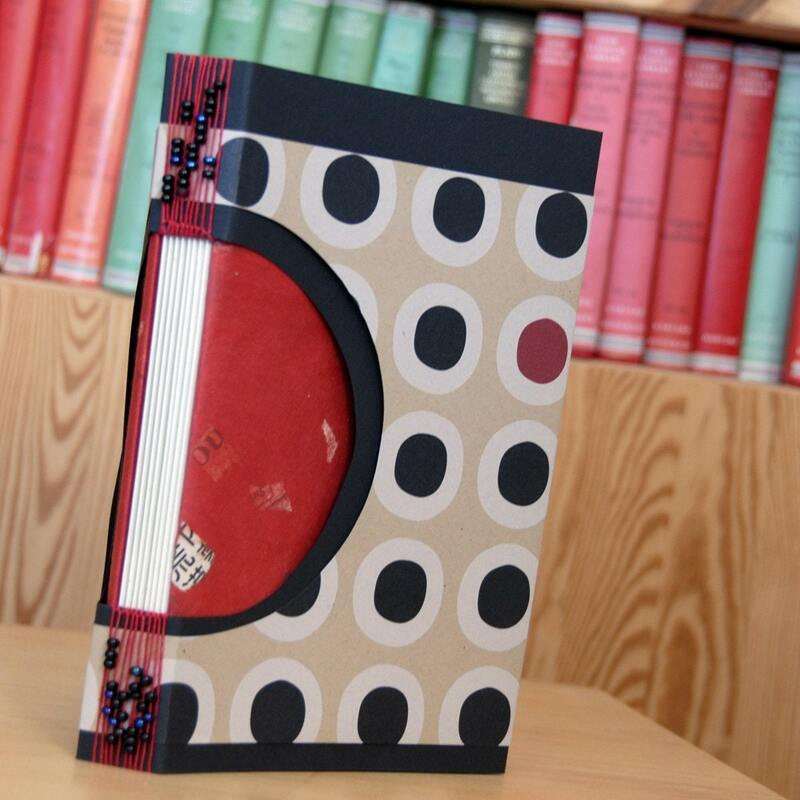 I love looking at what other bookbinders are doing. The Bookbinding Etsy Street Team consistently inspires me to be a better, more adventurous binder. Both for form and content, Keith Smith’s series of books on binding are very inspiring. As I mentioned before, I am often inspired to make books that will serve a specific function, like encouraging me to keep a daily journal or be durable enough for dirty garden notes (books that will hold up to mud, not x-rated garden ideas). I also have a ton of fun making books and one book always leads me to the next idea. I can’t ever make the exact two alike, there is too much to play with to do that. 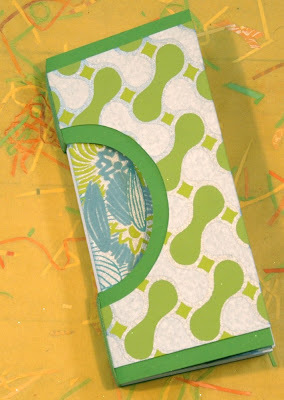 I love combining decorative papers and colors. I love making ‘ugly’ color and pattern combinations with the cover paper, or calming ones, or festive, bright, loud and entertaining. I usually cut circles in the covers to show off the endpapers, but have recently started cutting silhouettes of Presidents, hearts, stars, and (at Halloween) skulls. If I ever run out of ideas, I might just stop making books. That’s not going to happen in the near future though. Oh, I do hope this won't happen! We surely would miss your cheerful and colorful creations! Thank you for taking your time for this interview. If you want to see more of her books - and maybe grab one - go and check out Purplebean Bindery. Wow- So inspiring! I love that first photograph of you with the books. Love your work- thanks for sharing!! Great post, Hilke and Anna! I love your work and it's so interesting to hear about how you work and what else you do. Such an inspiring post. I wish I could make books, but I can't so I buy lovely ones like this. I loved the interview. I am hoping to get into bookbinding. I adore the picture of you surrounded by stacks of your books - inspiring!